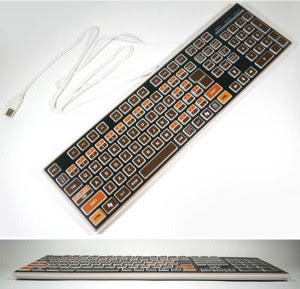 an ATARI keyboard??! - Hello! Welcome to my blog! Now, how many of you have lived in the 80's? ok, let's just say born in the 80's? (raised hand up). Yeap, i'm still in the 80's man, and who the hell forgets the good old games? let's say uhhhhh ATARI. hehe relive the past and check this cool keyboard usb compatible made by a Japanese company known as NAYAMI. cool huh? Although i am not sure if they thought of the ergonomics of they just thought that it was cool to have this as a keyboard. 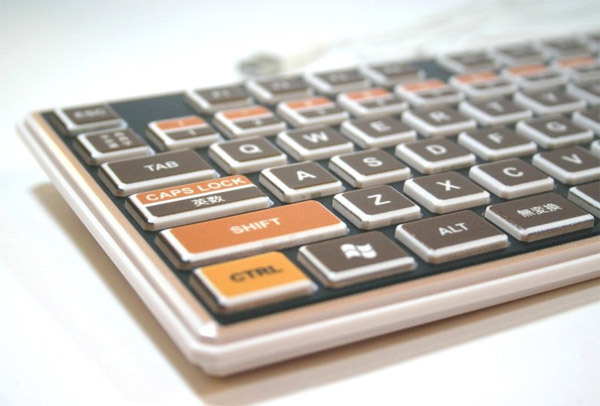 I'm sure clickety typers there wont enjoy this keyboard much since it's kinda thin and the keys don't stand out much. Typing for a bit long in this thing and you could get a serious carpal tunnel syndrome. Gadget freak mix signing out! "Sony Tablet" yes.. Sony has not one.. but TWO! ZERO / ZIIIRO numbers on a watch? FUJITSU laptops with Pico Projector? Chrono Trigger on PS3 and PSP. Magic Wand is the the remote! KUNG FU PANDA 2!! Kaboom of Doom!! N.O.D. (No Ordinary Duet) deserves a NOD. 2012 is the time for TMNT OOZE!!! !